Three boys came to help me on Saturday at the Main Street office. All three are from the OPSU Upward Bound program. Jonathon Ibarra, Valdemar Sanchez, and Jonathan Guerrero were all on time and willing to help however I asked. They took out trash, swept the floor, and started hanging posters in windows. People are shocked to learn how much time it takes to hang posters around town. People are showed to learn how long I can avoid sweeping the floor and taking out the trash. So, you know I was happy to see the kids. I’m in the office on this Saturday because it’s the day I can work and have less visitors and meetings. And because this morning three Main Street Transformers left with two adult Main Street mentors to visit Alabaster Caverns. They all left the office at 8:30 this morning laughing and knowing they are going to have a wonderful time. I am not sure whether Terry Brand and Kristine Scott are more excited about going or the kids, Taos McIntyre, Alfonso Ortega, and David Ortega. I am so lucky to work with people with such giving hearts and great attitudes. There are a lot of people who don’t have such great attitudes. Some are also very unappreciative. For them, instant gratification takes too long. The kids that I see when we have the community clean – up are probably the ones that are going to continue working as community volunteers. Likely they’ll be the Lions Club members who run the boats and trains at the park. One of them will probably be the Tail Twister at the Tuesday meetings (first and third of each month at 6:30 pm). There are some great youth in our community. Sometimes we just need to make it a point to teach these kids things that are important. It is unfair to just expect them to pick it up automatically. That’s why Theresa Carillo is teaching a free class on Interview Techniques at the OPSU Guymon Classroom at 304 NW 5th on Feb. 21. The class runs from 6 – 8 pm. Be sure to get an advantage on that job that you want and learn about ways to come out ahead in the interview. It is always good to improve ourselves. It is always good to educate ourselves. On Wed., Feb. 22, there is a free Healthy Heart Luncheons for ladies. It’s a Red Dress event, meaning the ladies are encouraged to wear red. You have a chance to learn more about your heart. There are some excellent speakers, including a cardiologist, the mean is healthy and catered by Virgil Gibson. There are folks there to give a BMI (body mass index), blood pressure check, blood sugar test (Ac1), and a voucher for a blood cholesterol check, all free of charge. Some folks really want to help us get healthier. The next day, Thur., Feb. 23, has another free lunch available to seniors (over 55 years in age) at the Senior Citizen’s Center on their Appreciation Day. They are also having some BINGO. That fun starts at 11:30 am and ends at 3:00 pm. The center is located at 515 NE 15th Street in Guymon. That evening from 6 – 8 pm, Carillo is teaching another class, this one about writing a resume. That, too, is at the OPSU Guymon Classroom and has no charge. 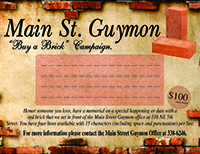 At the same time, on the same evening, is the Main Street Guymon Awards Evening at the RC Party Room on 5th and Main. Some great folks are getting recognition that night and we would love to have you come to it. The cost is $25 a ticket and this is another Virgil Gibson meal. Time for me to get some work done.